ROGERS, Ark. (AP) Minjee Lee wasn’t all that concerned when she missed her first cut of the year this month at the ShopRite LPGA Classic. The 22-year-old Lee needed only 24 putts during her opening 64 on Friday, helping her to match the low round of her career. Despite needing 28 putts Saturday, she still briefly took the outright lead after reaching as low as 14 under after a birdie on the par-5 seventh. Lee missed the green on the par-4 ninth soon thereafter to lead to her only bogey of the day and a tie with the 19-year-old Hataoka, who is in pursuit of her first career win. Hataoka birdied six of eight holes midway through her bogey-free round on Saturday. 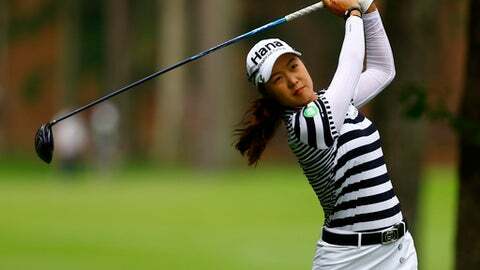 It was yet another stellar performance from the Japanese teenager, who has finished in the top 10 in four of her last five tournaments and will be a part of Sunday’s final pairing. Third-ranked Lexi Thompson matched the low round of the day with a 64 to get to 11 under. She hit 17 of 18 fairways and shot a 5-under 30 on her opening nine, The American is in search of her first win since September in the Indy Women in Tech Championship. Ariya Jutanugarn and Celine Boutier were 10 under. First-round leader Gaby Lopez followed her opening 63 with a 75 to drop to 4 under. Fellow former Arkansas star Stacy Lewis also was 4 under after a 72.